The Eurocom Corporate Trade Up program allows corporate customers to maximize their IT budget and acquire fully upgradeable, high performance Eurocom notebooks, Mobile Workstation, Mobile Servers and all-in-one energy efficient PCs in the most cost effective fashion. Technology upgrades are rarely considered a need and often comprise a large portion of an organizations yearly operating budget, while replacing an existing infrastructure can be expensive, cost isn’t the only consideration when upgrading equipment, what do you do with the old, obsolete equipment? Eurocom has solutions for both of these issues; by offering a trade up for your current computer you can reduce the cost of new equipment by up to 20%. The Trade Up program provides customers with prolonged life span of their computer hardware, as Eurocom systems are fully upgradeable, and the acquisition of more flexible portable computer equipment that allows more intelligent utilization of company resources than the traditional desktop based computer hardware. “The Corporate Trade Up Program allows companies to upgrade their aging desktop centered hardware to newer, portable and efficient computer technology without a major impact on their IT budget” explains Mark Bialic, Eurocom President. With workforces changing fast, the ease of movement becomes a crucial factor when buying new computer equipment. The Eurocom Trade Up program gives companies an opportunity to trade in their aging desktop-based PC hardware for the most advanced portable technology. 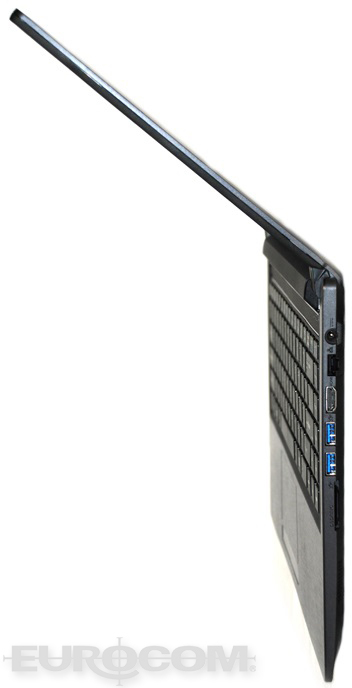 Eurocom Corporation offers a perfect solution for those companies who need the mobility of a notebook, but who do not want to compromise the power and functionality of a traditional desktop computer. Replacing aging technology allows organizations to restructure operations by incorporating Server on the Go (SOTG) and Engineering on the Go (EOTG) strategies, thereby allowing for more efficient and effective mobile operations. EOTG and SOTG allows for business activities anywhere in the world made available by capable mobile hardware solutions that allow engineers to receive and process feedback while being face-to-face with customers, co-developers, final users and other third parties. A key advantage in owning a Eurocom system is its upgradability. Eurocom has designed all its products for easy repair and easy upgrades. Upgrading your laptop’s components is a simple thing you can do to increase the longevity of your system, making it perform like a brand new machine with each upgrade. Having the ability to upgrade your machine reduces the likelihood of a full replacement in a few years allowing you to simply swap out parts, stretching budget dollars further. The Eurocom Trade Up program will accept any system, refurbish it and donate it to local schools in need, providing businesses, government, health care sector, educational institutions and individuals with a means of disposing of their aging computer hardware while helping students gain greater access to computer technology and acquire computer skills needed to succeed in today's economy and society. Why would I take advantage of the Eurocom Trade Up Program? 1. Latest Technology - Have the latest in EUROCOMs mobile technology, featuring power and functionality with various units to choose from to suit your specific needs. 2. Upgradability - Future upgradeability and expandability. You will have a unit that will help you keep up with current and future technologies. All EUROCOM notebooks and All-In-One purchases are fully upgradeable. 3. Warranty - Always have a new computer under warranty. You will have a new EUROCOM notebook and All-In-One that is under a standard one year warranty with an option to extend to a two or three year warranty. 4. Save Money - Save money on a new state-of-the-art EUROCOM notebook or All-In-One. Instead of disposing of your old EUROCOM, you will actually receive a discount from EUROCOM towards your new system. Since 1989, Eurocom has been a leading developer of long lifespan, fully upgradable notebooks, high performance mobile workstations and mobile servers. Eurocom has produced many firsts and continues to engineer solutions that inspire and enable individuals and companies to reach great possibilities. For more information on Eurocom please visit www.eurocom.com.